It was drizzling in Valparai when I started to Chalakudi late in the evening after I stopped there to have a cup of tea. I was not in a hurry, driving slowly I reached Malakipara Forest Check Post at around 6:00 pm. I stopped the vehicle in front of the barricade and went inside the office. A forest guard asked me in Malayalam, ‘where are you going’? ‘No, I don’t have any’. ‘I am going to attend my friend’s marriage there’. ‘I am alone and driving myself’. I opened my wallet, took out the half torn license and gave it to the forester. The forester leaned sideways from his chair a bit and looked at the vehicle’s registration number and entered in his huge ledger full of details of vehicles passing through that check post. He filled a verification certificate and asked me to sign on it. He returned my license and said, ’don’t stop anywhere and give this certificate at the other check post ’. It generally takes about 3 hrs to reach Chalakudi from Valparai. It was a deliberate decision to start late in the evening from Valparai so that I can see some wildlife while driving through that pristine rainforest. I had driven through this forest during the day few times but never travelled at night. I drove slowly in that twisting and curving road towards Vazachalal rainforests. It was late in the evening and sky full of monsoon clouds, however, there was ample light and there was no need to put on the headlights. I entered a forest road after few minutes. I leaned forward and looked up through the glass. Tall trees by the side of the road touching each other canopy. I was driving slowly in second gear and the maximum speed was only around 20 to 30 km/hr. It stared drizzling slowly. I stopped at one place where there was an opening of canopy due the passing Electric pylon. Hill mynas, Common mynas, Racket-tailed drongos, and Chestnut-headed Bee-eaters were flying around and catching the winged termites which emerged recently. 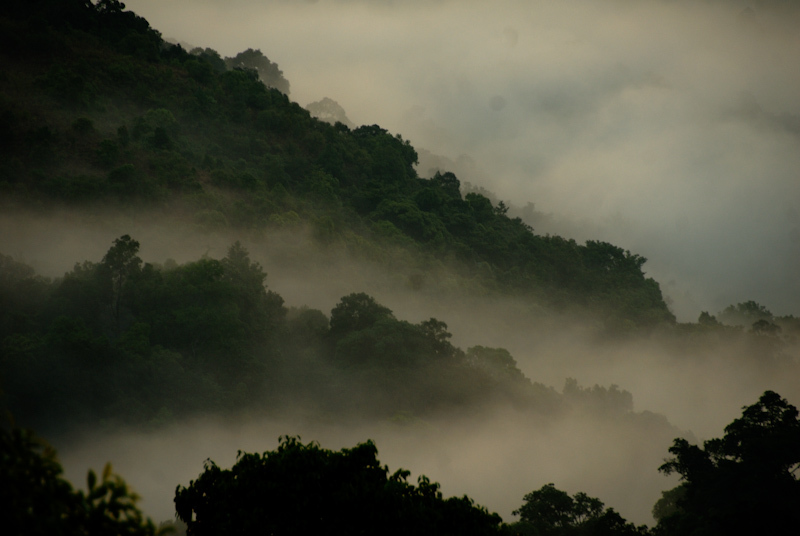 On the other side of the valley there was a breathtaking view of monsoon clouds passing like waves on rainforest canopy. The scene reminded me of a photo by Kalyan Varma showing similar view. After watching them for a while I started again and entered a road closed by rainforest tree canopy. Light was dim so I put on the headlights. Roadsides were clad with different varieties of ferns. They look beautiful from every angle even at night. It was at that moment that I noticed a movement by the side of the road. It was a small frog that jumped from one end of the road and almost cleared the width of the road just by two jumps. One more jump and it would have gone into those ferns and other plants with leaves of different shapes and sizes. But it didn’t. It stayed right there. I slowed down a bit, swerved away from the frog and went past. There were quite a few on the way. I saw another frog but this one did several jumps to reach even at the middle of the road. The width of this road was about 4 to 5m on an average. I had to be a bit careful while passing this type of frog. I had to drive past this frog keeping it in-between the two tyres and hoping that it doesn’t move from the place where it stopped. After passing few more frogs I put off the headlights. Although the natural light was less under the closed canopy it was still possible to see what was in the front. It was a Sunday but surprisingly there were not many vehicles going towards Athirapalli – a waterfall – a major tourist destination. Obviously it was too late for tourists to go there at this hour, but there were quite a few vehicles going past me towards Valparai. In all the vehicles that passed by, headlights were on and they honked at me as well while passing. I had to wait by the side of the road to make way for them. On one such occasion my car stopped. Before turning it on I waited there for a while. I came out of the car and stood by the side of it. 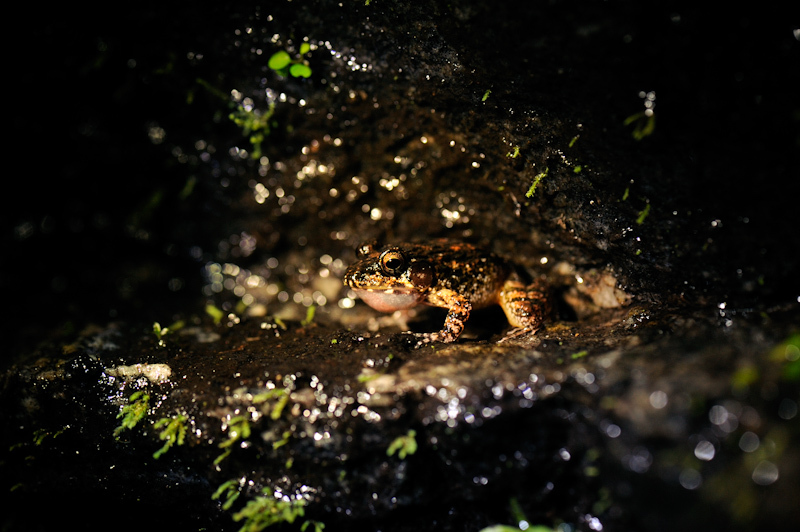 I was surrounded by the cacophony of frog calls of varying resonance. What an amazing feeling to be alone inside the rainforest at night and listening to this frog music! Rainforests never sleeps, I thought, birds and cicadas give life during the daytime and it is these frogs that keep the rainforests alive at night, especially during the monsoon. This momentary enjoyment came to an end when I felt a Tup..on my forehead. This time it was a raindrop. I started my second gear journey through the rainforest again. It was not a heavy downpour but I had to close my windows to avoid water dripping in. Soon rain stopped but it was replaced by a thick fog. I had to be even slower this time. I was thinking about the fate of those jumping frogs. ‘Even if I don’t want to drive over it I can’t do much in this fog’. Who else is going to drive slowly like me on this road? People will think I am mad if I ask them to avoid driving over frogs and stop for them to cross the road, I thought. It was around 9 pm and I was passing through Oclandra reed forest. I opened the windows and here insects subdued frog calls with their loud and continuous chirping. There was fresh signs of elephants on the road. Bamboo shoots were strewn along the road for a short distance and I noticed fresh dung. No vehicle had passed me for more than half an hour. A slight sense of panic surrounded me, but it was gone the instant I noticed a bunch of tourists on the road. They were dancing in the middle of road to some song blasting from their vehicle which was parked by the side. As they noticed my car they moved a bit to make way and while I was passing them they whistled and shouted. Few kilometers passed and there was a small village. Here there was more Krok…Krok…Krok and less Tik..Tik..or Tuk..Tuk..May be different types of frogs, I thought. This Krok was non stop without any pauses. But this was only for a short distance, once the forest started, I experienced the same symphony from the rainforest frogs again. As I was driving, I noticed something long – like a glittering stick by the side of the road. I stopped and reversed the car and came near to that and it was a snake. It was there lying with its raised head as if it is going to catch something. And then I heard a vehicle behind. I quickly opened the door and stepped down and stamped my feet a couple of times on the ground near the snake. It immediately turned and slithered away into the forest floor. I had to be quick to get into the car and moved ahead a bit so that the other vehicle could pass. Again it was the same tourist vehicle and again they shouted as they passed by. I was not pleased by what happened. Forest roads should be forest roads I thought to myself. It shouldn’t be flat and wide like in the plains. A good road inside the forest means death of several frogs, snakes and many other animals. Forest roads should have a lot of potholes, speed breakers, and preferably kachcha. Suddenly something came to my mind. While I was travelling through this forest wherever the road is not in shape with lot of potholes I didn’t see many frogs jumping in front of the vehicle. But in a flat tarred road I saw many frogs jumping around. So a good road in a forest is good for tourists and others, but is not so good for forests and its animals. 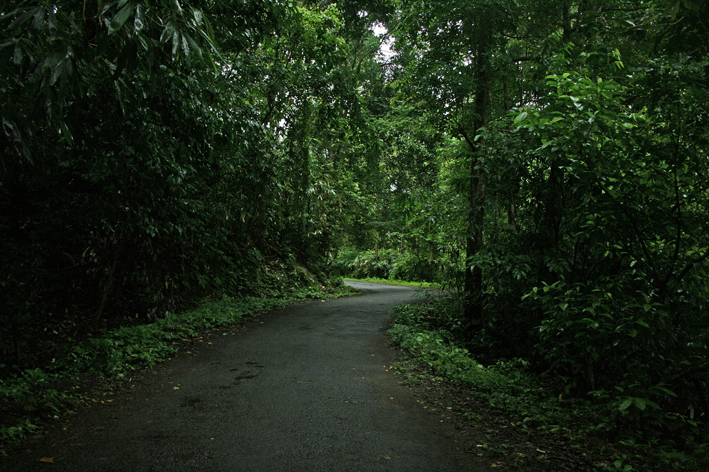 An example of bad forest road (except for the closed canopy) – Tarred, no speed breakers, no potholes. By this time I was nearing Vazhachal Check Post. After completing the necessary formalities with the foresters I started my journey towards Chalakudi. Road from here was wider, but still went through forests for some distance. After that there were several hoardings advertising on how cheap it is to stay at their hotels. There was more Krok..Krok..Krok..here and very few Tik..Tik..Tik or Tuk..Tuk. Not only that, but the calls too were coming from far way since the road is wider. I changed the gear from second to third and to fourth. I said to myself that I will restrict myself as far as I could by not traveling on this road at night time, for the sake of the frogs.